Line 6 muffin cups with paper baking cups. In small saucepan, combine vanilla chips and oil; heat over low heat, stirring until chips are melted and smooth. Pour mixture evenly into paper-lined cups. With back of spoon, spread mixture in thin even layer up sides of each cup. (Mixture may not completely cover paper in bottom.) Refrigerate 15 minutes. Reserve 3 small strawberries for garnish. Chop remaining berries. Meanwhile, crush just enough strawberries to make 1/2 cup. In small saucepan, combine crushed berries with marshmallows. Heat over medium heat, stirring constantly until marshmallows are melted. Stir in lemon juice. Cool 30 minutes. In medium bowl, beat cream until stiff peaks form. 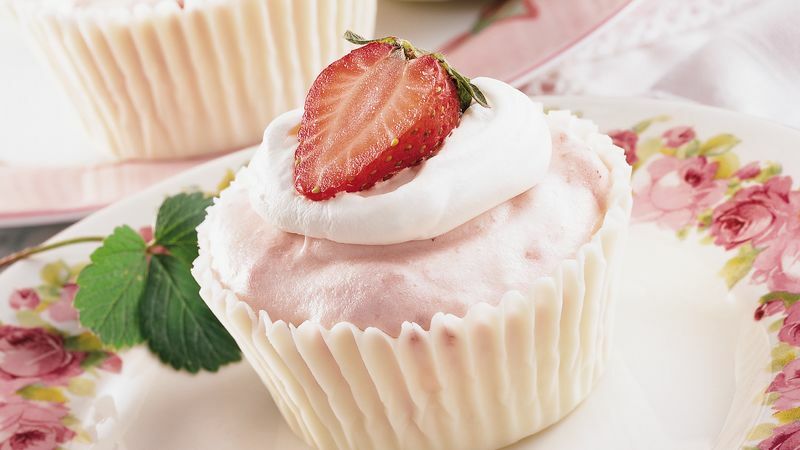 Set aside 2 tablespoons whipped cream for garnish; cover and refrigerate. Fold marshmallow mixture into remaining whipped cream. Fold in remaining chopped strawberries. Spoon into white chocolate cups. Refrigerate at least 4 hours or until serving time. Make a tear in top of each paper baking cup; carefully peel paper from filled cups. Garnish each serving with 1 teaspoon reserved whipped cream and a berry half. When removing paper from chocolate cups, a little chocolate may break away from the filling. Just press it back into the filling. Make the chocolate cups a day ahead and keep them refrigerated. This delicious mousse can be served in small, stemmed beverage glasses instead of in the white chocolate cups.